Fits trucks with 352, 360 & 390 engines. Available in 2-1/4 inch only and available for trucks with single gas tanks only. Kit includes 2 turbo mufflers, you can upgrade by choosing either Magnaflow or Flowmaster below and adding them to your cart. Flowmaster Mufflers are unique in that its performance improvement is paired with unique exhaust tones. 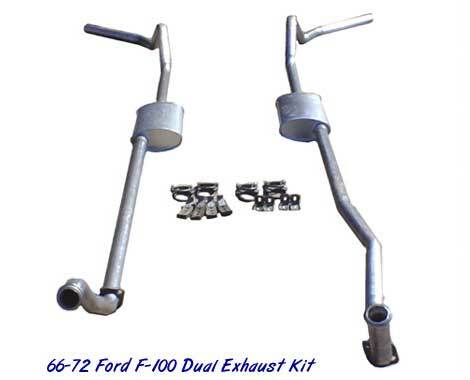 The "Flowmaster Sound" is offered in many different tones depending upon the muffler series. From the deep, aggressive tone of the 40 Series to a quiet and subtle, but unmistakably rich Flowmaster tone of the 70 Series, you will find the right application of performance and exhaust sound you want. MagnaFlow® Mufflers offer a one piece perforated stainless steel core that lets exhaust gasses fly right through. Nothing gets in the way to slow them down. The straight-through design improves exhaust flow to increase torque and horsepower. The core is wrapped with stainless steel mesh that creates a porous barrier that allows sound vibrations to pass freely into the acoustical absorbing material inside yet prevents blowout and deterioration of the material. Packed between the steel mesh and the steel shell is a dense wall of fiber that filters out the harsh exhaust vibrations producing a rich, powerful, performance tone. Copyright © 2018 American-Muffler.com. All rights reserved.